With the Dallas Cowboys, Jacksonville Jaguars, New York Jets and Baltimore Ravens all on a BYE week, fantasy football owners are going to have a hard time replacing some important fantasy football players. Whatever you do, do NOT jeopardize your future just for a one time use QB or TE. Think twice before dropping someone! The Arizona Cardinals will have to rely on Drew Stanton to finish the season as Carson Palmer tore his ACL on Sunday. The matchups moving forward for Arizona are not QB friendly, especially in the fantasy football playoffs when they face the Kansas City Chiefs, St. Louis Rams and the Seattle Seahawks. I would look elsewhere for a QB if you are in need of one for a permanent replacement. The Denver Broncos backfield just got even more complicated with the return of Montee Ball, the Ronnie Hillman injury and the 163 total yards gained by C.J. Anderson last week. I don't know what to you tell you. What I do know is that Denard Robinson has scored 4 touchdowns in the Jaguars last 4 games, but has seen a decline in yardage each week starting at 127 vs the Browns October 19th, to just 60 this past week in London. He did score twice in that game though, and if I were you, I would trade him during his bye week! 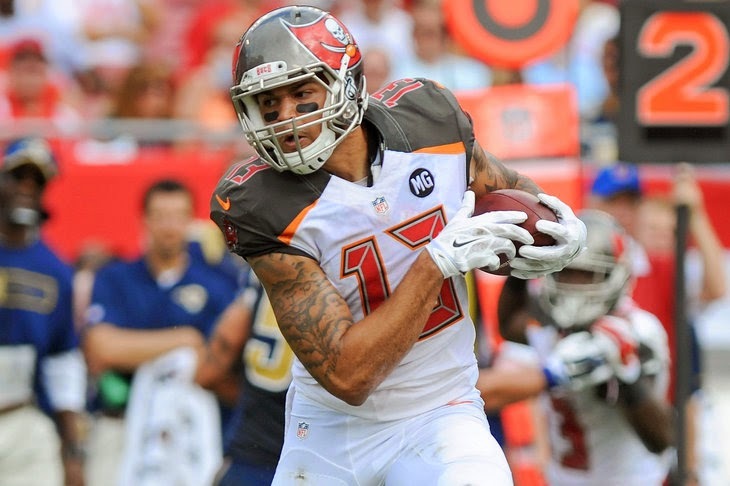 Mike Evans is quietly having an exceptional rookie season with the Tampa Bay Buccaneers. His 39 receptions is 5th amongst rookies behind Brandin Cooks, Allen Robinson, Sammy Watkins and Kelvin Benjamin, and his 585 yards receiving is 3rd behind Watkins and Benjamin. He is one of 4 rookie receivers with 5 TDs, Martavis Bryant has 6 touchdowns in 4 games and Benjamin leads with 7 after two in garbage time on Monday Night Football. Gronks Back! He leads all TE with 30 receptions for 416 yards (no other TE with more than 250) over the last 4 weeks, and the Pats didn't even play in Week 10! I wasn't willing to draft an injury plagued TE at his ADP (31) but congrats to those of you who took that chance! I drafted Jimmy Graham in the 1st round instead!